Female connections, bronze body, and silicone seat. Designed for maximum intermittent water pressure of 125 psi. Suitable for temperatures up to 212 F (100 C). Not for continuous pressure use. A polished chrome model is also available (up to 1 size only). All models comply with ASSE Standard 1001, listed by IAPMO, and approved in all major cities and states. CSA approved up to 1 size. Designed for use where open tanks or basins are filled by a hose below the water line; in appliances where water enters below the overflow rim; or in lawn sprinkling systems. Other applications include medical, surgical, therapeutic, and mortuary tanks. 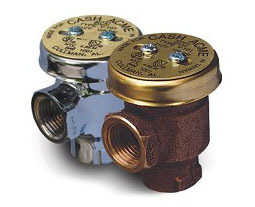 The V-101 and V-101C are certified to ASSE 1001 and CSA B64.2 hose type connection, and are listed by IAPMO, ASSE, and CSA.